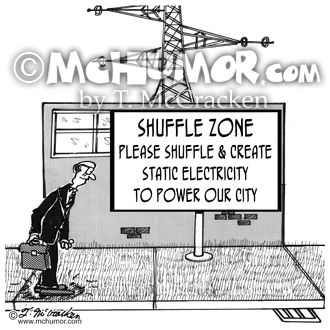 Electric Cartoon 1738: A rug in front of a power company with a big sign, "Shuffle Zone. 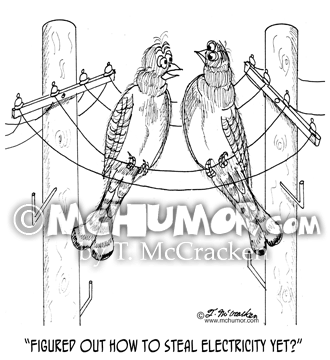 Please shuffle and create static electricity to power our city." 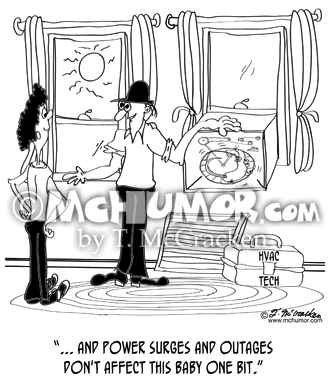 HVAC Cartoon 8685: An HVAC technician says of an air conditioning unit with a hamster in it running in a wheel, "... and power outages on really hot days don't affect this baby one bit." 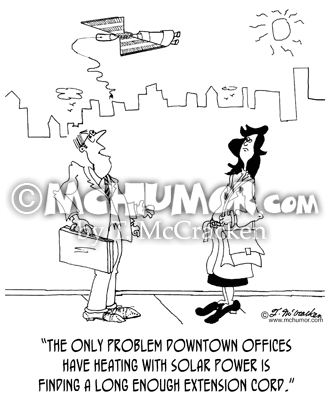 Power Cartoon 7298: Looking at satellite above a city skyline with a cord hanging down someone says, "The only problem downtown offices have using solar power is finding a long enough extension cord." 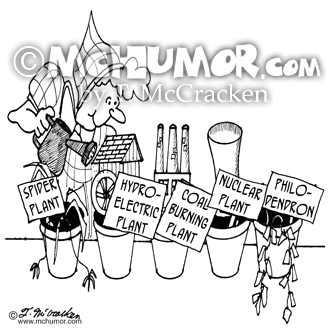 Plant Cartoon 3277: A woman waters her plants which include a spider plant, a tiny hydroelectric plant, a tiny coal burning plant, a tiny nuclear plant, and a philodendron. 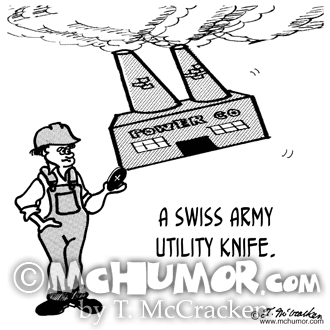 Utility Cartoon 2721: "A Swiss Army Utility Knife." A man flips a large power plant from his knife. 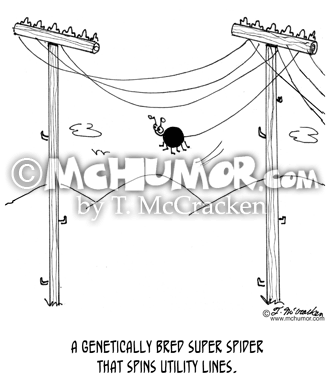 Bird Cartoon 2749: A bird sitting on a utility pole asks, "Figured out how to steal electricity yet?" 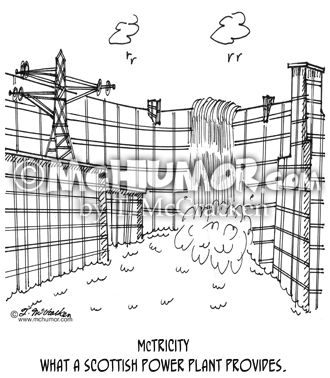 Utility Cartoon 5997: "McTricity--What a Scottish power plant provides." 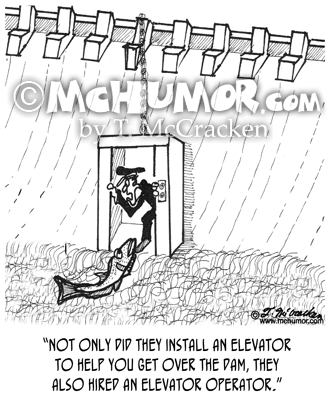 A plaid hydroelectric plant. 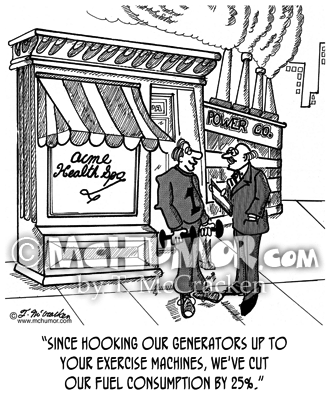 Exercise Cartoon 1060: A power executive says to a man outside a health club, "Since hooking our generators up to your exercise machines, we've cut our fuel consumption by 25%."